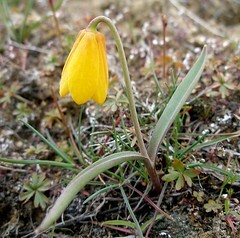 One of the first spring flowers in the Sage Hills is the distinctive bright yellow bell. Its nodding bell-shaped flowers grow singly or in pairs on the end of a short stem, four to twelve inches tall. They tend to become more orange as they age. The narrow smooth leaves grow one to six inches long and in pairs or groups of three or more near mid-height on the stem. The root of yellow bells is a nutritious bulb that was one of the first to be dug in the spring. It tastes like sweet potato and was considered a delicacy. It was eaten raw, steamed or boiled.